Hype are a Liverpool based youth led organisation who are working with us on a number of projects over this academic year. They are a social enterprise group who work with young people to improve urban environments. Phase 1 of the HYPE project in school has just been completed. 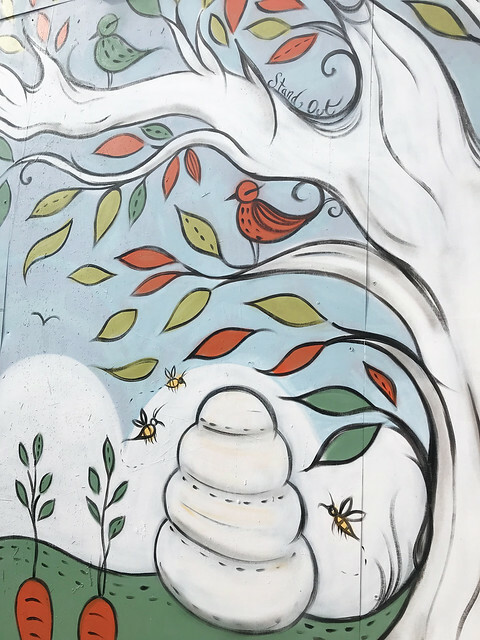 Anyone who has been in the school yard will have noticed the beautiful new mural and plant boxes situated on the wall just outside the Drama Theatre. This is the culmination of a lot of hard work and dedication from our students and the Hype team. The planters have been made in our workshop, painted and planted by students. The mural which is all about 'flourishing in life' depicts a scene from nature, but also remembers people important to St Cuthbert's who are no longer with us. A red flower to represent Mrs Gallimore, a yellow canary to represent Mr St Pierre, a paintbrush to represent Jess D, musical notes to represent Carl E and conkers to represent another ex student Mr G Davey. The mural was painted by Artist Charlie Backhouse. The next phase start next term and will involve a different group of students who will be breathing some love into the area outside the large dining hall. We can't wait to see the results!